Home » cricket news » IPL 2018, KKR Vs RR: Which team qualifies for Qualifier 2 in case of a washout? Cricket Fans are eagerly waiting for the crisp encounter in Kolkata. 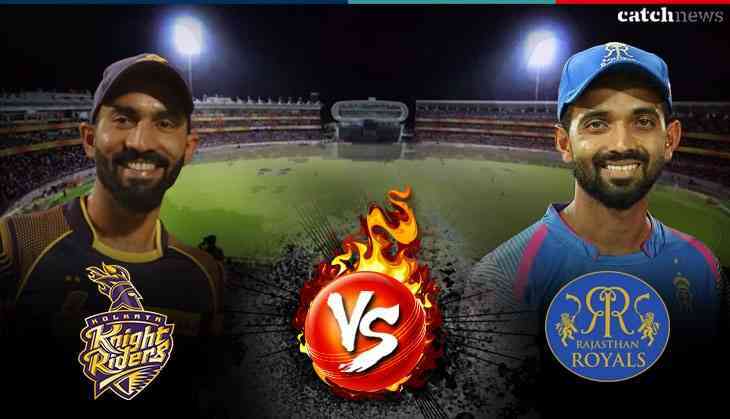 The Excitement of the fans is at their highest peak and wants to enjoy the IPL 2018 Eliminator game between Kolkata Knight Riders and Rajasthan Royals. But, there is a huge chance of Rain interruptions at the Eden Gardens in Kolkata. In this case five over match per side is the minimum criteria to yield results. However, if the match is washed out then the Knight Riders will advance to meet SRH in Qualifier 2. Dinesh Karthik led KKR will automatically in qualifier 2 in case of rain interruptions because KKR is only the team which ended up third position at the end of leagues. However Ajinkya Rahane led Rajasthan Royals ended up at the fourth position. The Qualifier 2 will be played on 25th May at the same ground that is Eden Gardens where KKR and RR will try to move little bit closer to have IPL trophy in their cabinet . The Qualifier 2 winner will then lock horns with MS Dhoni-led team in the finale that will be played at the Wankhede Stadium in Mumbai on Sunday. The first match of IPL 2018 playoffs was a nail-biting after which the Chennai Super Kings (CSK) registered their slot in final beating Sunrisers Hyderabad (SRH) by 2 wickets.